This is a written review of 'VT Sweet, Extra Vanilla Vanilla Custard (S.EV.VC)' created by James and Jade from Vaper Train, who own a web based E-cig store, situated in Wellingborough, Northamptonshire. My opinion of this juice will be my true and honest opinion as always. The juice I am reviewing is 24mg 50pg/50vg, and is one of their new E-liquids in the 'VT Buffet Car' Range. A new line of Premium made juices using only the best ingredients which are all sourced in the UK. I am using a dripper at 1.0 ohm on my Roller, with a fresh battery set at 4.2 volts. The Sweet, Extra Vanilla, Vanilla Custard E-liquid comes in 50% PG and 50% VG mix, and comes in 10ml, 30ml and 50ml bottles with child proof caps. This 'VT Sweet, Extra Vanilla, Vanilla Custard (S.EV.VC)' is a sweeter and more creamier vape than Vaper Trains 'VT Vanilla Custard'. It is for those who like their juices much sweeter and creamier. On opening the bottle, straight away the aroma led me back to my mothers homemade vanilla custard. Filling the kitchen with creamy vanilla goodness, as the aroma from the fresh vanilla pods literally took my breath away. It was, creamy and rich. with a fragrance so unmistakably good, I couldn't wait to try it. On the inhale, the richest, sweetest, creamiest flavour, coated the whole of my mouth. Filling every part of my palate, with a thick, moreishly yummy, Vanilla custard. The name says it all, as it was so different from the others I had tried. This was sweet without being cloying. The e-liquid was like sticking your tongue inside an amazing custard filled pastry, licking every square inch, leaving a trail of gooey goodness on your tastebuds that lingered on your palate for a while afterwards. This flavour was sublime and anyone who likes their dessert vapes will like this one. On the exhale, the luxurious taste of homemade vanilla custard, I could sense the heavy cream, egg yolks, the good vanilla pods and the sweetness of the sugar all combined into this small piece of vaping heaven to give a high quality Vanilla Custard. This was silky and smooth, creamy and sweet, and simply delicious. I couldn't compare this to any vanilla custard I have tried before. They are all delicious in their own right, but each one totally different. Each one having a character of it's own. 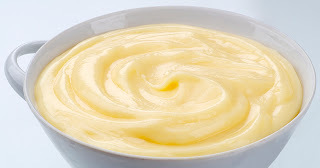 There are so many different varieties of vanilla and different ways of making custard. There hasn't been one I haven't enjoyed. This one was very sweet and creamy. Not one I could particularly vape all day. I would enjoy it after a meal, or sitting relaxing in the evening writing my book. This flavour has to be savoured to be enjoyed. You can savour each flavour separately. It certainly does have ambience, giving it character. Buy some and try it for yourselves. You won't be disappointed. The throat hit was a little mild for an 24mg juice but that is fine for me with sweeter flavours, and the vapour production was extremely good, for a 50/50, pg/vg blend. This is another E-liquid from Vaper Train I have thoroughly enjoyed. Buy some and try it, you won't be disappointed.